Rajiv Gandhi Institute of Technology, Bangalore, Karnataka, India. Received July 8th, 2010; revised August 12th, 2010; accepted May 21st, 2011.
and those of the experimental valu es, proving the suitability of the boundary conditions. gineers to achieve improvement in vehicle fuel efficiency. hundred thousand operating cycles have to be simulated. dure for calculat ion of wear. strain of an element in an explicit manner . pressure distri b uti on [2 7-29]. produce Al composites f ree from unsoundness. microstructure with noticeable weight savi n g s.
used as the matrix material is given in Table 1. Table 1. 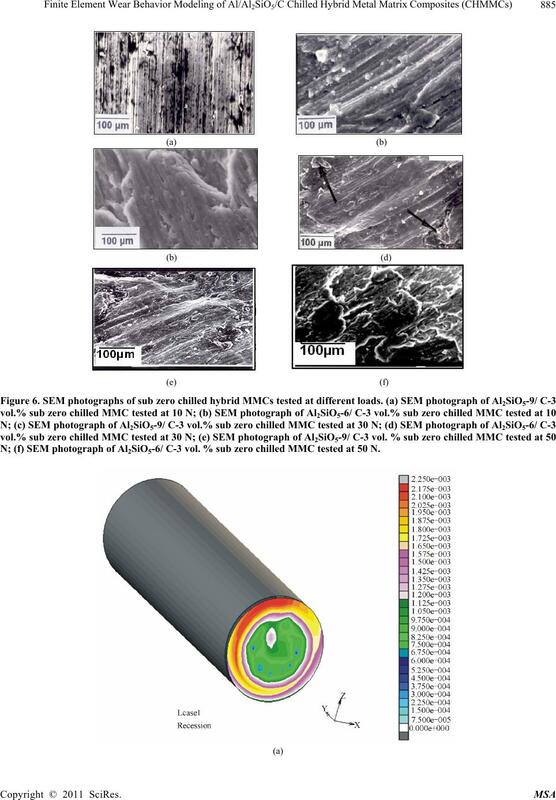 Chemical composition of matrix material (Al-alloy LM 13). specimens were heat-treated by aging before testi ng. wear process is introduc ed to formalize the wear kinetics. Figure 1. Pin on disc model for measuring wear rate. the wear over a time period. 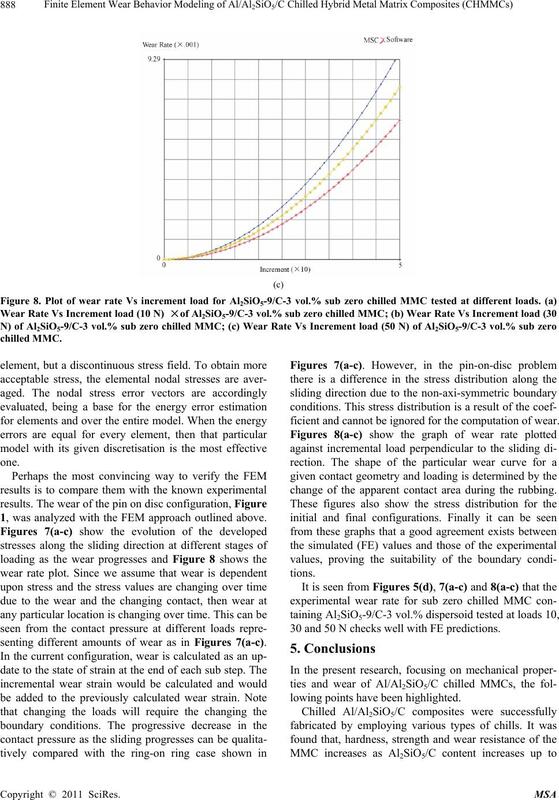 ing Al2SiO5-9/C-3 vol.% dispersoid, cast using sub zero chill. the MMCs increases to a peak value and then drops again. Figure 3. 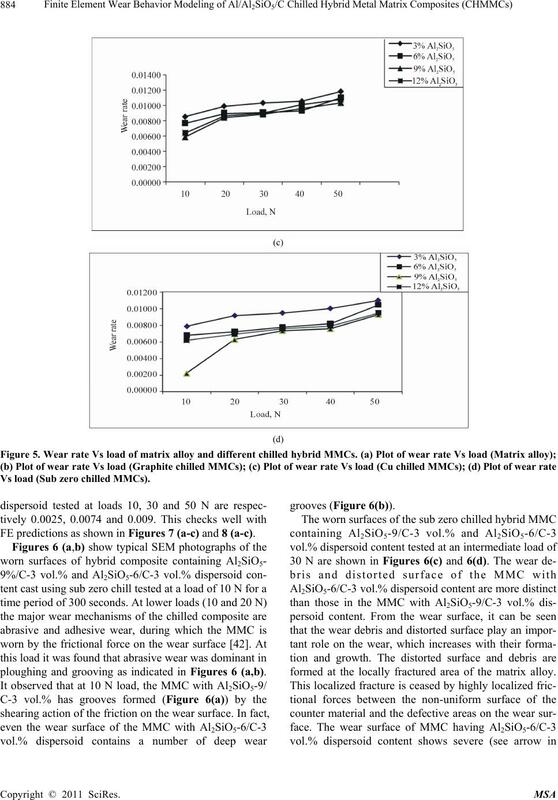 Hardness Vs dispersoid content of chilled hybrid MMCs. ness is due to addition of combination of dispersoids. strength, h ard ness as we ll as for wear. Figure 4. 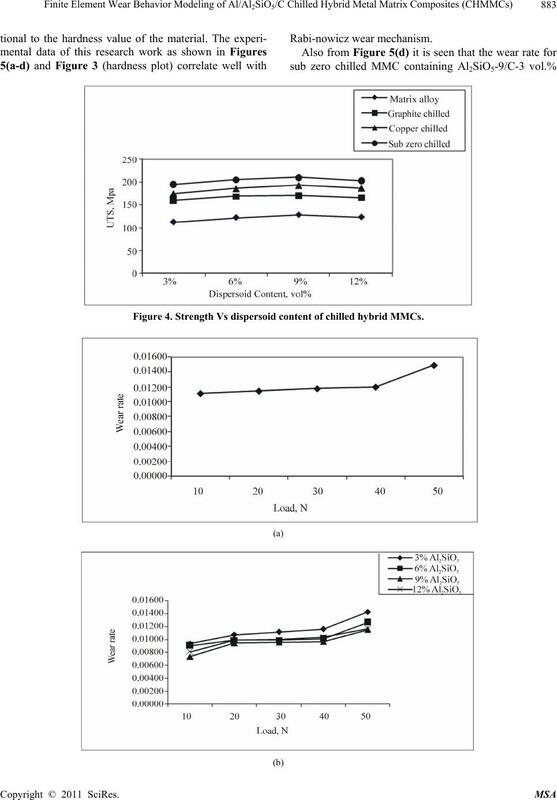 Strength Vs dispersoid content of chilled hybrid MMCs. Vs load (Sub zero chilled MMCs). FE predictions as shown in Figures 7 (a-c) and 8 (a-c). ploughing and grooving as indicated in Figures 6 (a,b). formed at the locally fractured area of the matrix alloy. N; (f) SEM photograph of Al2SiO5-6/ C-3 vol. 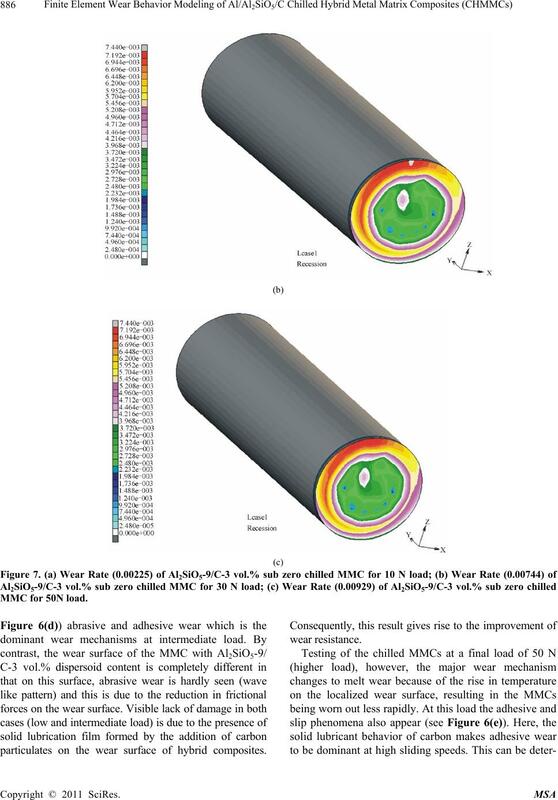 % sub zero chilled MMC tested at 50 N.
particulates on the wear surface of hybrid composites. might be related to melt and slip. 1, was analyzed with the FEM approach outlined above. senting different amounts of wear as in Figures 7(a-c). ficient and cannot be ignored for the computation of wear. change of the apparent contact area during the rubbing. 30 and 50 N checks well with FE predictions. lowing point s have been highlighted. 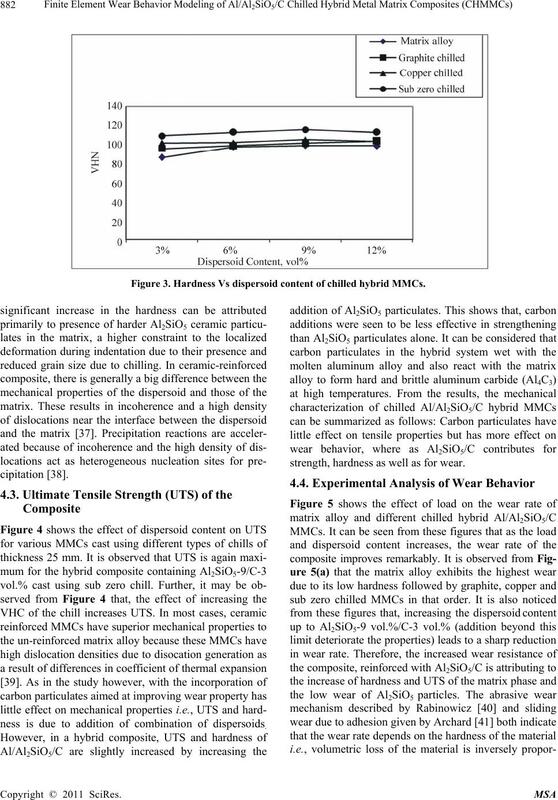 wear surfaces of the composites were seldom observed. model provides a reasonable description and justification. Science, Vol. 30, 1995, pp. 843-849. Vol. 63, 1997, pp. 1-8.
terials Processing Technology, Vol. 63, 1997, pp. 68-75. Bangalore, India, No. 3, 1995, pp. 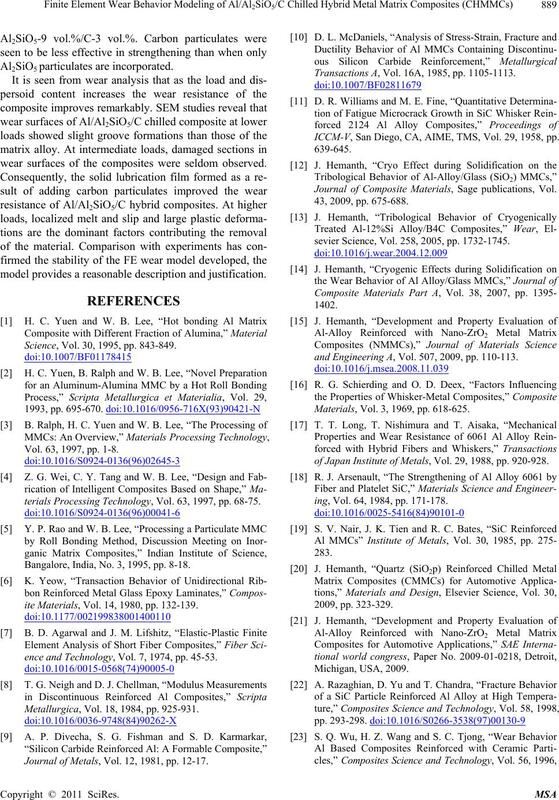 8-18.
ite Materials, Vol. 14, 1980, pp. 132-139.
ence and Technology, Vol. 7, 1974, pp. 45-53. Metallurgica, Vol. 18, 1984, pp. 925-931. 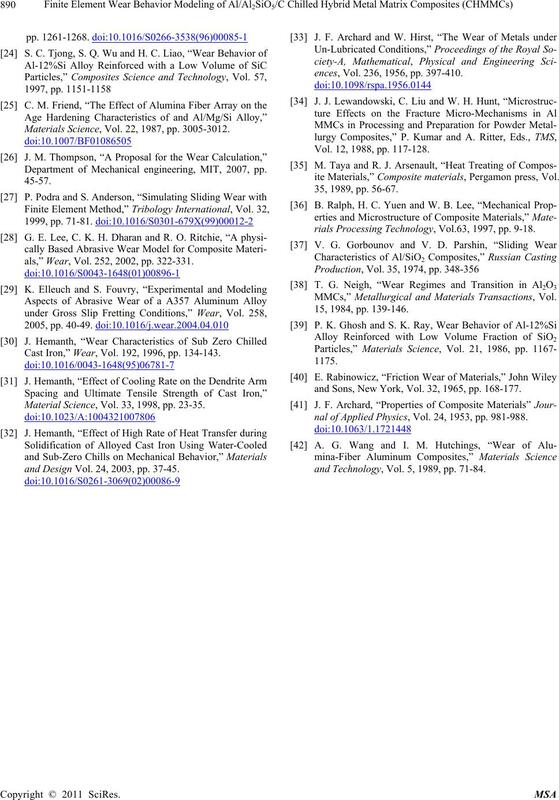 Journal of Metals, Vol. 12, 1981, pp. 12-17. Transactions A, Vol. 16A, 1985, pp. 1105-1113. ICCM-V, San Diego, CA, AIME, TMS, Vol. 29, 1958, pp. 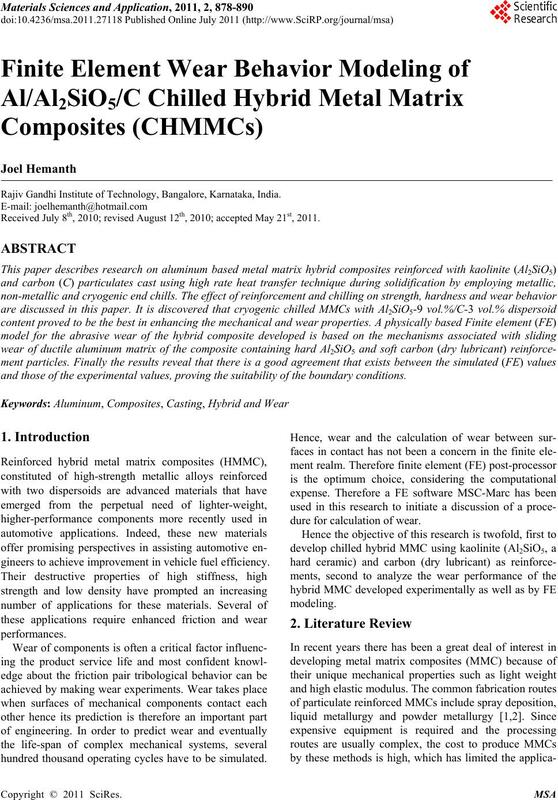 Journal of Composite Materials, Sage publications, Vol. sevier Science, Vol. 258, 2005, pp. 1732-1745.
and Engineering A, Vol. 507, 2009, pp. 110-113. Materials, Vol. 3, 1969, pp. 618-625.
of Japan Institute of Metals, Vol. 29, 1988, pp. 920-928.
ing, Vol. 64, 1984, pp. 171-178. 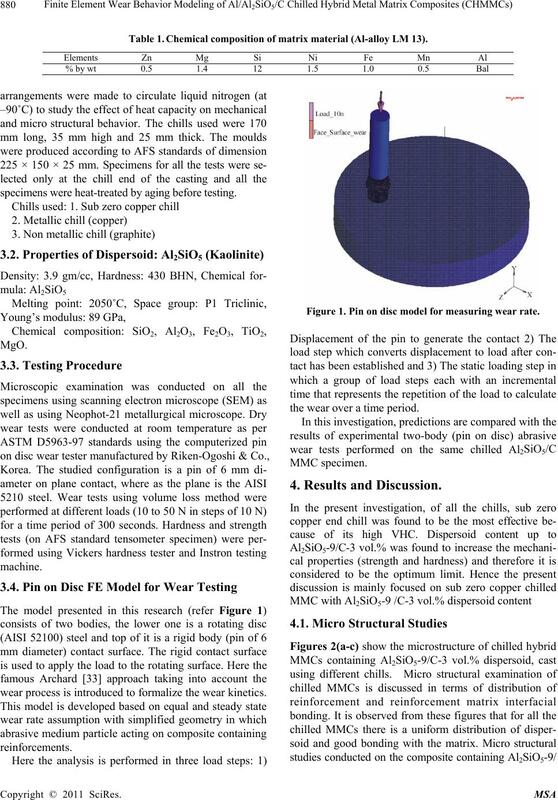 Materials Science, Vol. 22, 1987, pp. 3005-3012. Department of Mechanical engineering, MIT, 2007, pp. 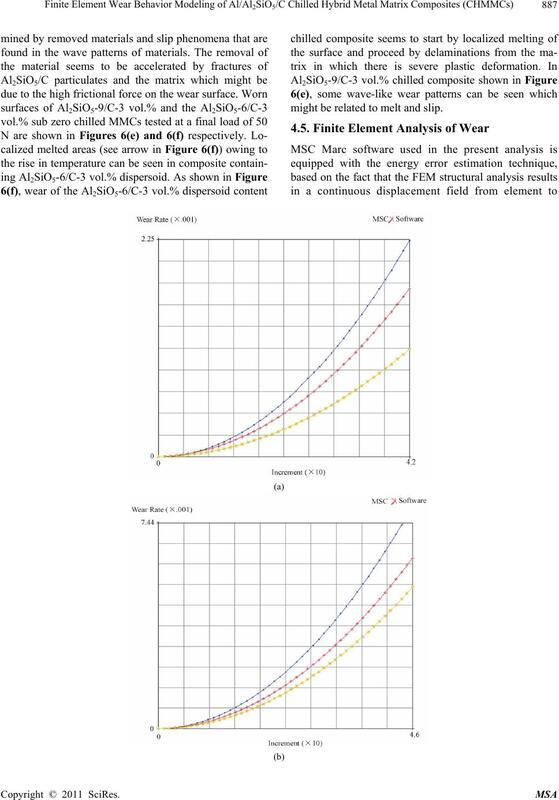 als,” Wear, Vol. 252, 2002, pp. 322-331. Cast Iron,” Wear, Vol. 192, 1996, pp. 134-143. 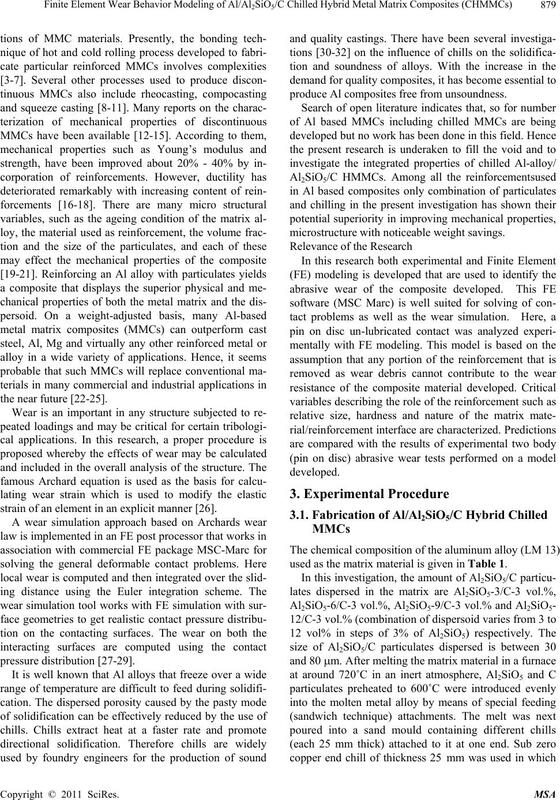 Material Science, Vol. 33, 1998, pp. 23-35.
and Design Vol. 24, 2003, pp. 37-45.
ences, Vol. 236, 1956, pp. 397-410. Vol. 12, 1988, pp. 117-128.
ite Materials,” Composite materials, Pergamon press, Vol. rials Processing Technology, Vol.63, 1997, pp. 9-18. 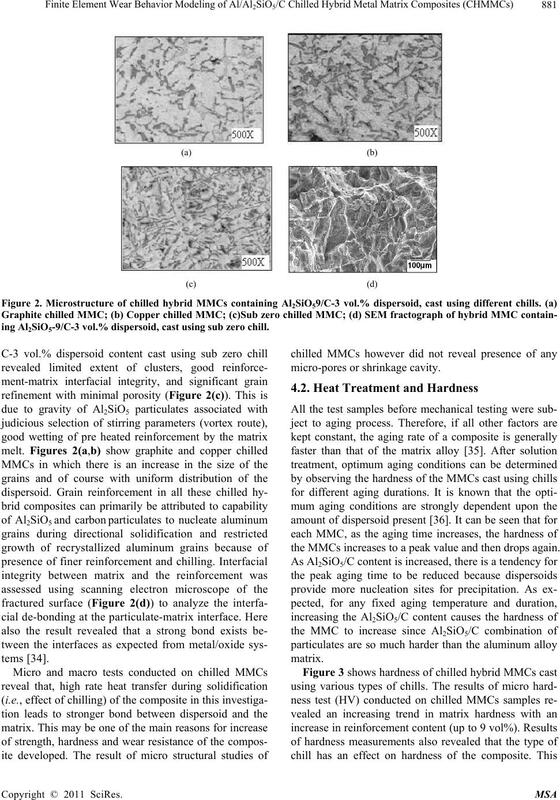 MMCs,” Metallurgical and Materials Transactions, Vol. and Sons, New York, Vol. 32, 1965, pp. 168-177.
nal of Applied Physics, Vol. 24, 1953, pp. 981-988.
and Technology, Vol. 5, 1989, pp. 71-84.